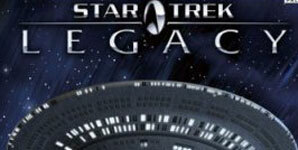 STAR TREK: LEGACY is an epic game of Starfleet combat covering the entire Star Trek Universe. Players become the Admiral of a task force of warships and must lead their fleet to victory in large-scale battles. As the Admiral of the Fleet you choose the ships, equipment, and captains that you will lead into battle. The game is designed to provide an immersive strategic and tactical experience by emphasizing the dramatic excitement of large-scale battles without the hassle of complex starship management. Dynamic three-dimensional battlefields. Beautiful space environments filled with fully realized nebulas, wormholes, planets, and stars. Intuitive controls allow players to quickly select targets and destinations in 3D space. Detailed weapon effects and damage modeling. Weapons searing with energy and charged shields that surge with every hit. Ships with full damage modeling that break apart, strewing debris and sparks. Customizable fleets, ships, and captains. Victories earn Command Points, which are used to personalize your fleet, ships, and captains. Single player Federation campaign. Spanning three full epochs (Enterprise, The Original Series, and The Next Generation). Robust multiplayer with full Xbox Live support. From small-scale engagements to all-out war involving multiple star systems. Matchmaking, stat tracking, and player rankings on Xbox Live. Over sixty ships and four playable races. From small scouts and light cruisers to fearsome battleships. Command the powerful fleets of the Federation, Klingon, Romulan, and Borg races. All beautifully rendered with the latest technology.